WHEN you play the Game of Thrones you win or you die. Fortunately the stakes are much lower for those who just want to enjoy the TV show with a dram of whisky. As part of a collaboration with series producer HBO, Diageo has released a limited edition series of single malt whiskies, each tied to one of the great houses of Westeros (as well as the Night’s Watch) from Game of Thrones. 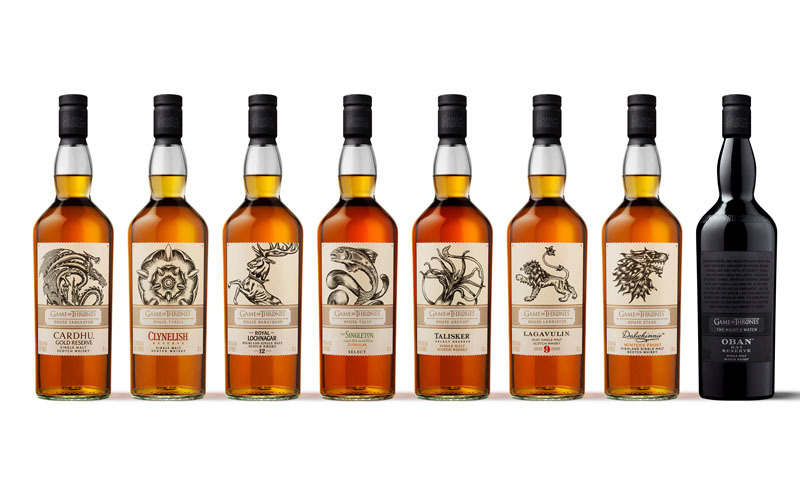 The collection comprises: House Stark (Dalwhinnie Winter’s Frost, £48, 43% ABV); House Tully (Singleton of Glendullan Select, £38, 40% ABV); House Targaryen (Cardhu Gold Reserve £48, 40% ABV); House Lannister (Lagavulin 9 year old, £65, 46% ABV); The Night’s Watch (Oban Bay Reserve, £65, 43% ABV); House Greyjoy (Talisker Select Reserve, £48, 45.8% ABV); House Baratheon (Royal Lochnagar 12 year old, £38, 40% ABV); and House Tyrell (Clynelish Reserve; £48, 51.2% ABV). The new Game of Thrones malts follow the launch of White Walker by Johnnie Walker late last year; the range of single malts will be available in the UK from Friday, February 15, ahead of the final series of Game of Thrones in April. Pedro Mendonca, global reserve marketing and malts director at Diageo, said: “We are always trying to find fun and interesting ways to introduce our Scotch portfolio and what better way than partnering with Game of Thrones, one of the most successful TV series ever created.